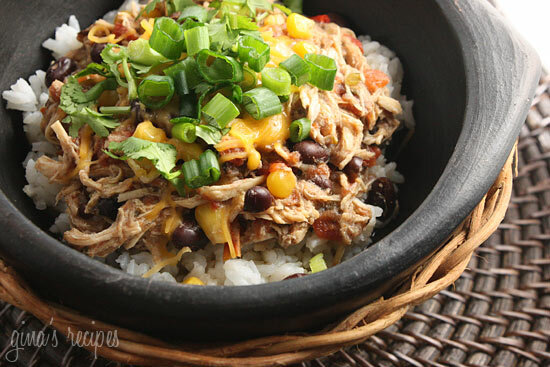 Slow Cooker Santa Fe Chicken made with corn, black beans, tomatoes and seasonings has been one of the most popular recipes on Skinnytase since I started this little blog. It’s the perfect dump and go slow cooker recipe – no pre-cooking, and made with pantry staples. It’s also healthy, inexpensive and can be enjoyed so many ways. Instant Pot directions are now included! And if you’re on Weight Watchers it’s now 0 Freestyle Smart Points (minus the toppings and rice). You can top this with a little sour cream and reduced fat cheddar cheese and call it a meal, but I often serve this over cilantro lime rice or cauliflower rice. And don’t forget the toppings – chopped scallions, fresh cilantro, fat free yogurt or sour cream and cheddar are my favorites. Leftovers are great over baked nachos with reduced fat cheese and jalapeños or served over greens for a Santa Fe Taco Salad. It’s even great used as filling for enchiladas. Here’s the basic recipe, how you use it is completely up to you! It’s also kid-friendly, freezer friendly and gluten-free. In it’s honor I decided to revive it from the archives and give it some love. To meal prep, place in microwave safe plastic or glass containers with rice, quinoa or cauliflower rice and toppings and refrigerate to reheat for the week. To freeze, divide and freeze in 1 cup portions in freezer safe containers for homemade freezer meals, ready anytime. To reheat, thaw overnight in the refrigerator and reheat in the microwave. on in the morning for an easy weeknight meal. Cook on low for 8 – 10 hours or on high for 4 to 6 hours. Thirty minutes before serving, remove chicken and shred. Return chicken to slow cooker and stir in. Adjust salt and seasoning to taste. 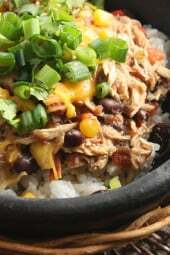 Serve over rice or tortillas and with your favorite toppings. Cook high pressure 25 minutes, quick or natural release. Love this! Did as others suggested and doubled the spices – I tend to up the spices anyway! I also added a dried pepper…serano I think- added some nice smoky heat, also added half an onion chopped since I had it handy.. Added a little extra chicken as I wasn’t sure this would make enough for the hungry fellas but of course the shredded chicken goes a long way! Have used this on tostadas, a salad and some nachos and it worked great on all. So glad I found this! I make this recipe several times a year. My family loves it and it is VERY easy to make!! I make this meal on weekly basis!! Love it so much. It’s healthy, cheap and quick! I use can corn instead of frozen and fire roasted tomatoes & a separate can of green chili’s. Absolutely delicious! The recipe was inexpensive and easy to throw together. 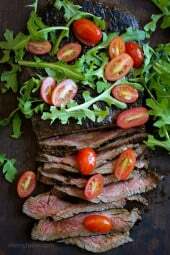 We found it to be incredibly satisfying and flavorful which is not always the case with healthy meals. This is going in our regular rotations. Two thumbs way way up! i love this recipe. But i work for a non-profit that feeds over 400 women and children three times daily, so i need recipes that serve large crowds. If you want to actually taste anything I rocommend you double each seasonings and and salt. Original recipe was incredibly bland. I love this recipe! However I’m on a new strict diet that must be gluten free AND low cholesterol. For the life of me I can’t figure out why the cholesterol is so high, can anyone help? My husband lowered his cholesterol 40 points by eating ST recipes. Check out her vegetarian and gluten free recipes. Those categories are located in the right hand side of this page. Has anyone tried putting in enchilada sauce? I made this to put over baked potatoes. It was too soup-like so I took the lid off the crockpot to reduce liquid….then I forgot I did that! So I reduced it a bit too much and to remedy that I just tossed in a can of Rotel tomatoes and added hot mexican chile powder and more cumin. I like it hot. Delicious! I still do pointsplus. How many points is it for that method? Thank you. This is definitely a keeper!! I liked it with wheat rice, my husband liked it with tortillas so either way it was the bomb!! Thank you for sharing. This has been a go-to as a crockpot recipe … I got an InstantPot for Christmas and can’t wait to try it there. It is perfect for a WW friendly lunch with some fat free refried beans. Hello! This was my first slow cooker meal ever. Thanks for making it such a great one! I altered slightly by first sautéing onion, a sweet pepper, and garlic in olive oil. I used home cooked black beans. Otherwise I followed the recipe! The flavors really melded in this dish and the chicken came out tender and delicious. I had enough to serve now plus freeze for later. Win win! Exceeded my expectations. Will definitely cook this again. 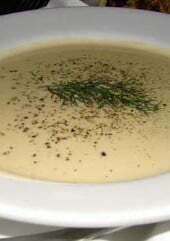 I’ve made this recipe before using an old crock pot about 3 years ago and it was delicious. (I had to follow step by step due to my very limited kitchen skills) this is why I am asking how do you use the instapot with this recipe without everything getting mushy? I have made this one many times before but now that I have an instant pot, Gina can I make this in the insta pot? It seems a little too soupy. Can I reduce the chicken broth? I have no cumin, any sub? Will the recipe be ruined without it? To late to go to the store. This was very good. I served it over riced cauliflower. As some of the others mentioned, the consistency was more like soup. I will definitely make again, but I may use half the amount of broth. Otherwise, it was very tadty. I was really hopeful with this one per all the great reviews, but it was just okay. It was lacking in flavor, and the broth made it too soupy. I guess doubling the spices would help, which by the way, I used chili powder in place of cayenne as I can’t handle cayenne. How do I adjust for frozen chicken in the Instapot? I love this meal. I make it for lunch prep. I use my Instant Pot and In 2 hours from start to finish I have about 12 meals in the freezer. I serve with TJ organic brown rice. In mornings I will get one out and pack it with as much fresh spinach as will fit. I also like mine spicy so I add about a half of a small can of diced jalapeños. Yummy. Made this on Monday and it’s now a favourite in our house; thank you! Once I shredded the chicken and mixed it back in and left it for a bit (about 20 more minutes), it was not too soupy like many others have commented. We put it on the cilantro lime rice the first time (YUM!! ), then in a burrito with leftover rice and extra fixings, and then as a open faced pulled chicken sandwich. All have been winners. Any recommendations on making the remaining leftovers into a pasta??? This recipe is seriously 5 star. I made it last week and my husband and I ate it 4 days in a row – 2 days as crunchy tacos and 2 days with brown rice. It’s hard to decide which way was better. I left out the cilantro (I’m one of those cilantro-is-the-worst people) and used 2x the spices since I had extra chicken, used a full 12 oz. bag of frozen corn (why not? ), and hid 2 green bell peppers in there for some extra hidden veggies. Topped with green onions, avocado, and cheddar. This recipe is definitely going to become a regular! Any thoughts on how long to cook the ingredients if I already have the shredded chicken? Do you have instapot instructions for this? Fresh or frozen chicken? Just trying to get the timing right! I love this recipe and so does my husband! I have a question – would this be suitable as a freezer meal? i.e. prep/combine ahead, freeze everything in a ziploc, use/cook later? I am pregnant and wanting to stock up on freezer meals, would love to include this one. Today will be the 2nd time that I’ve made this. I didn’t use broth, cilantro or cayenne. I used a drained can of corn instead of frozen, some squeezes of fresh lime & crushed pepper flakes instead of cayenne. I also chopped up half of a small onion. The cooking time is a major issue; if you cook boneless, skinless breasts for as long as stated in the recipe, you’ll have dry, cardboard chicken! I’ve cook b/s chicken breasts many times in my 7 quart, original Crockpot for no more than 51/2 hours on LOW. No. The diced tomatoes or Rotel have liquid as you don’t drain them & as it cooks, liquid comes out of corn, etc. I’ve never had an issue. I’ve also made this with b/s thighs, which you can cook for 7 or 7 1/2 hours if you need to. I’d do b/s thighs for 6 1/2, always on low. I goofed and didn’t drain the beans; I just dumped it all in. I was having a brain fart:/ is not draining the black beans a bad thing for this recipe? This is a great tasty recipe and what makes me happy is that my picky husband likes it too! Double all four seasonings, substitute spicy black beans for the standard black beans, and you can skip the cilantro. I make my modified style weekly for meal prep and it’s fantastic. Could you use kindey beans instead or would that ruin it? EXCELLENT! I used ground coriander (1/2 tsp) and ground cumin (1/2 tsp). The combo makes an excellent Mexican spice. My husband loved this recipe. Served over cilantro lime rice. Another yummy recipe. I make this all the time. So delicious. When I shred the chicken, I also ad a block of cream cheese to crockpot. So creamy. Serve with Mexican cornbread or tortilla chips. I love this recipe. I do find it soupy so I’ve actually eaten it as a soup and it is delicious with a little WW shredded cheese and fat free sour cream. Also freezes great. Such an easy lunch to bring to work. I do leave out cilantro because I’m not a fan. And I only used diced tomatoes without Chile’s because I like more of a mild heat. LOVE LOVE LOVE IT! I made it in the crock pot and have been eating it for dinner (I added a little more broth to make it a tortilla soup) and then at lunch time over lettuce, (tastes like a taco salad)! I do not think I will ever tired of it! Excited to try this – it’s in the crockpot now! I’m just wondering though, I imported my ingredients to my fitness pal and the nutrition facts are significantly different with no additional toppings.. It’s coming up as over 300cals and over 50gC, I matched the exact ingredients and amounts.. Okay I just redid it and the nutrition facts pretty much match yours. I don’t know what I did wrong the first time! I’m sorry for the unnecessary comment! Hi!! I need to make this for a large group. Do you think it would turn out ok if I doubled the recipe? I can’t find black beans that have 0 smart points. Is there a particular brand that is used? BTW! I love this recipe! This has become a favorite in my home!! I always make a large batch and freeze the leftovers in meal-sized portions. Thank you! This is by far the best meal to serve for a casual dinner…everyone loves it. I serve it over rice but my grandkids love to drain the liquid and serve over nacho chips with cheese, salsa and sour cream as the toppings. Plus it is extremely easy! Two thumbs up! I just purchased my first ever slow cooker a few months ago, and I’m kicking myself because the one I bought doesn’t have a timer, the only options it has are 4 or 6 hours on high, and 8 or 10 hours on low. So a lot of recipes I can’t do on work days because I would be gone for too long, but this would be perfect since I could do it for 10 hours while at work. However, I wake up at 4 AM for work, and no way am I getting up any earlier to make dinner in the morning! Your recipe says: “Prep this the night before and turn your crock pot on in the morning for an easy weeknight meal.” Can I really just throw everything into the Crock Pot the night before and leave it in the fridge overnight? Even the chicken? Or should I add the chicken separately in the morning? yes it will be fine! You can buy a timer to plug your slow cooker into. Then you can set it to come on when you need it! This recipe as is turns out very liquidy. So if you want to use it as burrito filling, it won’t really work unless you drain. The liquidy aspect would complement serving over rice. I don’t have a crockpot, but I do have a Dutch oven, how long should I leave it in the Dutch oven (if this is even possible)? Thanks! This really is GOOD. I was bored of our weeknight dinners and luckily stumbled upon this gem. It’s SO EASY (made while dealing with my one year old son!) and delicious! I was nervous it would have that Heat-up frozen meal sort of taste, but the fresh ingredients are just enough to make it perfect. I used yellow rice with it. Will be keeping this in the rotation for sure! Can this be made with shrimp instead? How long do you think it would take to cook on the instant pot? You could cook everything in the crockpot and add pre-cooked shrimp for the last 3-4minutes or raw shrimp might need 7-10 minutes depending on the temperature of your crock pot. Shrimp would probably taste great in there as well but I would just add it at the end instead to avoid over cooking. This Santa Fe Chicken is really awesome I can just eat it right as soup and it fills me up. I love it I didn’t change a thing very very good. I dont have a slow cooker. Is there a way I can make this in my rice cooker? Should I add more broth? Thanks! I tried to sign up for your emails & it is telling me my email is invalid ???? could you please sign me up on your end? ???? Great. recipe! It was a little juicy so I added some rice near the end. However to keep it 0 Weight Watchers points I’d just cut back on the liquid. This was a big hit in our house last night! I didn’t have any tomatoes on hand so I used homemade salsa and cut the broth way back. It was still a little soupy for us after cooking so I added a little cornstarch to thicken it up and get a nice sauce. It was awesome on a wrap for lunch today. Will definitely make again!! Thanks for adding the pressure cooker specifics!! I’ve been making this with my crock pot for years, it’s one of my faves!! I wanted to try it in the Instant Pot. I just entered this in to my macro tracker and my carb count is way higher than yours? I used a smaller can of black beans and tomatoes so I am not too sure what I am doing wrong? On a seperate note this reciis really great! Perfect for meal prep for the week. Another amazing recipe Gina! Very interested in making this…where’s the cilantro rice recipe? Thanks. 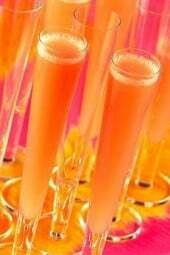 Looks awesome & cant wait to make. . I will not be addinng extra salt. Enough salt from the broth & can foods. Thanks for sharing wonderful recipes. This is so good! Thanks for sharing the recipe. I accidently only added one cup of broth (I was on the phone) and I’m glad I did. I also left out cilantro and scallions, because I don’t like them. Tried this on salad and corn tortillas, going to try cauliflower rice next! Yum! Made this last night in the Instant Pot and it was delicious! I used Goya low sodium petite black beans and the beans did not get mushy. At first it looked a bit soupy to me, but after I shredded the chicken I let the dish cook on sauté for about 5 minutes and it let it cook down a bit. Served it with the Lime Cilantro Cauliflower Rice which absorbed some of the liquid. Will definitely make this again, only next time will make a double batch and pop some in the freezer. Gina has it in the recipe above. 25 minutes. Then either natural or quick release. I did natural release. I made it tonight for dinner. It came out a bit soupy but I put it on saute for a bit and the cauliflower rice absorbed. You can always ladle it out but it tastes so good. That’s a great idea, to let it saute a bit. I love this recipe and made it for the first time in my instant pot and thought it was more soupy than when i did it in the crock pot. I’ll remember that next time i make it. It was great for my meal prep though! Can I use frozen chicken breasts in the crockpot? Does that add additional time? All I ever use (for the most part) is frozen chicken. The IQF (Individually Quick Frozen) chicken breast, thighs, tenderlions, ect… That are sold in big bags in the freezer section, are absolutely fine to use in a Crock-Pot. They do not contain bones, so t In fact, I usually check on them about. 2/3 of the way thru the recipe recomendation, and pull them out of the potright when they’re done, so as not to over cook them. Also, if I am cooking something in the crock and I find that there is too much liquid at the end after removing the protein, I simply let the remaining crock ingredients cook longer to concentrate and reduce the liquid until it is the consistently I’m looking for. Or…if you’re short on time…place the crock contents into a sauce pan and reduce on the stove top…. Despite what some other comments say, you should NOT ever use frozen chicken in a crockpot. Yes, it will work, and you’ll *probably* be okay, but it’s not considered a safe method so I wouldn’t take the risk, especially if you are cooking for kids or elderly people with compromised immune systems. A crockpot cannot reliably get the chicken up to temperature quickly and evenly enough, which means bacteria can grow. I second Angela M.’s comment. That is the only type of frozen chicken I use in crockpots. It has worked totally fine for my family without anyone ever getting sick. When I use my Weight Watchers app to enter the nutritional information, it comes up at 4 freestyle points. Any idea why this may be happening? Too watery in the instant pot. Need to tweak the ratios. I’d love to try in the instant pot!! But not sure how I would go about altering the recipe… ideas? You don’t have to alter the recipe at all…. we had this as our first meal in our new InstantPot & it was DELICIOUS! Super super easy! I used onion because I forgot to buy scallions then at the end when I adjusted seasoning I added a little Mexican hot chili powder to give it a kick. It was really good! We ate it over brown rice and topped it with cilantro, avocado, and cheese. I made a double batch so we could use the leftovers for other meals this week! There was a lot of liquid leftover so I just ladled some extra out which was no big deal. I also did not drain my tomatoes and my chicken was partially frozen still so that could be why it had so much liquid. It’s a very versatile recipe/flavor combination! We was very tasty but it had to much liquid … I had to drain it before I served it. I had the same problem with too much liquid, husband thought it was soup. Still very tasty and added brown rice to help with all the juice. For those asking; a 1/2 cup of brown rice is 4 pts. 7 for a cup. My family and I really enjoyed this meal???? Unfortunately this was a big fail in my house, so bad that my husband didn’t eat it! Now I skipped the cayenne because I was worried it would be too hot and that was my problem I think. But without the pepper it was totally bland and really hard to eat. Don’t make without the cayenne! I used a half teaspoon of red pepper flakes instead of cayenne, and it was perfect! I didn’t have cayenne pepper, so I substituted chili powder and red pepper flakes! I served with brown/quinoa rice and topped with cheddar cheese. Yummy! I just started weight watchers this week, and this recipe (along with skinny cow ice cream bars) has given me hope that I can do this! Did you give this recipe 1 star despite not having followed it correctly? Hello, when I enter the nutrition info into the WW app, it gives me 4 points. Is the rice included in the nutrition info? No rice is not included. Also, you have to use WW recipe builder to get accurate points. This was really good. It was soupy though. I think next time I make it, I’ll leave the chicken broth out altogether, then add a cup or so of salsa. I’ll definitely make this again. I served it over rice and it was a hit with my company. Another one of my favorites! Love the flavors of this dish. I add a little lime juice at the end and serve over cauliflower or brown cilantro lime rice. Winner Winner Chicken dinner! Great meal for the family with plenty of leftovers for my lunch for the week!! Plus, it’s super easy to put together before you leave for the day. This is probably my husband’s favorite recipe ever! He keeps saying I could eat this all day everday! Really enjoyed this tonight. Husband said “do-over”. Not exactly a tortilla soup, but similar. Made cilantro lime rice and made bowls. DH commented that he didn’t have to salt or pepper it. Highly unlike him! Could this work with a pork loin as well? Do the canned black beans get mushy in the instant pot? I’ve heard this can happen but have never tried a recipe with them yet. I would think they would get mushy, yes. Maybe we could add the beans and corn after the chicken is done and shredded, then put it on simmer to warm everything up. My beans and corn did not get mushy at all. they absolutely never get mushy. Black beans have been in crockpot recipes on Gina’s site since the dawn of time lol. No, they did not get mushy for me. It was a bit more liquidy than I was hoping for, so I may drain the tomatoes or half the broth next time. Do you just dump it all in the instant pot. New to the I.p. please help! Wondering how it is 0 smart points with rice? I have made this a million times and it has become a staple in our recipe rotations. Today I did not have any corn so I tossed in about 1 1/2 cups of fresh spinach and some additional chopped onions. It looks and smells great! Can’t wait to see if it is as good (or better). How did it work with the spinach instead of corn? This recipe is delicious! I altered a little because of available ingredients at home. I used half a small oniuon instead of 3 green onions. And served over quinoa. Flavor was great as is but could garnish with sour cream or avocado. Also would be great topped on a green salad. Forgot to say, I used boneless chicken thighs. So if you don’t have breasts on hand, thighs work just as well.